Technology is changing rapidly. Just when you got used to Gigabit Ethernet speeds being a fast & reliable system, someone unveiled 10GbE, 25GbE, 40GbE or even 100GbE systems a few years later. 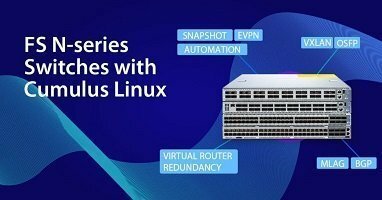 The newer and higher performing iterations are indeed the great breakthrough for the telecommunication industry, but also pose difficulty in choosing network migration path—10G to 40G to 100G, or to 25G to 50G to 100G. We have described 10G, 25G, 40G, and 100G Ethernet technology before, now in this blog, we’d like to introduce the four fiber optic cabling, and compare two 100G migration paths. 10 Gigabit Ethernet technology defined by IEEE 802.3ae-2002 standard is matured nowadays. Just like the “old” Gigabit Ethernet, 10Gb network can be terminated with either copper or fiber cabling. 1000BASE-T standard usually uses the Cat5e cables as the transmission media, while 10GbE bandwidth requires high-grade copper cables like Cat6/Cat6a/Cat7 cables to support 10Gbps data rate. For instance, 10G SFP+ 10GBASE-T transceiver modules utilize Ethernet copper cables (Cat6a/Cat7) for a link length of 30m. SFP+ direct attach cables (DAC) and active optical cables (AOC) are also regarded as cost-effective solutions for 10G short-reach applications. Besides 10G copper cables, there are single-mode (OS2) and multimode fiber patch cables (OM3/OM4) applied to different 10GbE IEEE standards. 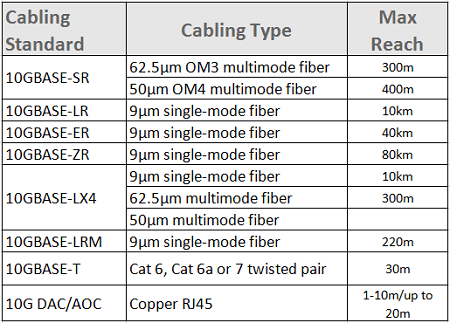 For the detailed information about the 10G cabling options, please see the following table. As to the 10G fiber optic transceivers, there are a series of optical form factors including the XENPAK, X2, XFP, SFP+. The former three 10GbE optical transceivers were released earlier than smaller 10G form factor—SFP+ module. However, owing to their larger footprint, they are not successful in the 10G hardware market. Furthermore, SFP+ optics, compliant with several IEEE standards (SR, LR, LRM, ER, ZR, and 10GBASE-T…) wins the heart of 10G end-users. When 25G Ethernet was developed to support a single-lane 25Gbps standard in 2014, it was treated as the “new” 10GbE technology but delivers 2.5 times more data. Compared to 40GbE that was based on 10GbE, 25GbE with one lane obviously improves the port density and cost requirement. 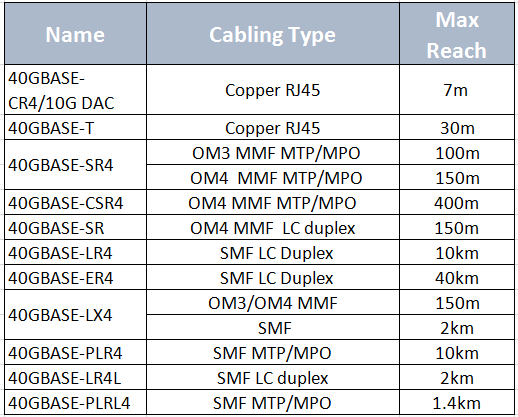 25GbE network can support both copper and fiber optic cables, seen in the below table. Similar to the 10GbE networks, 25G Ethernet physical interface specification supports several 25Gbps capable form factors, including CFP/CFP2/CFP4, SFP28 (1×25 Gbps) and QSFP28 (4×25 Gbps), which is also used for 100GbE. SFP28 25GBASE-SR and 25GBASE-LR SFP28 are two popular 25GbE optical transceiver modules available on the market, the former supports up to 100m link length while the latter allows a maximum transmission distance of 10 km. The available optical switches of the market do not support direct 25GbE connections using an SFP28 direct attach copper (DAC) cable. It is recommended to use a breakout cable that allows four 25GbE ports to connect to a 100GbE QFSFP28 switch port. FS.COM SFP28 DAC cable lengths are limited to four meters (1m, 2m, 3m, 5m) for 25GbE. And if you prefer a longer length, the 25GbE active optic cable (AOC) solutions are good recommendations. Like the 10GbE fiber optic cabling, there are several IEEE standards of the 40GbE transceiver in the whole evolution. 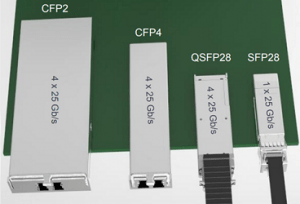 40G QSFP+ optical transceivers are the most commonly used optics for the 40G network. 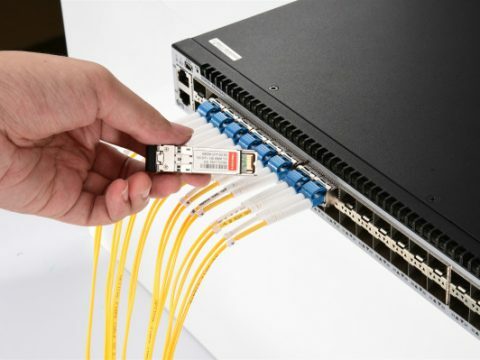 So how to choose fiber optic cables for 40G optical transceivers? The following table will help you out. Besides the QSFP+ fiber transceivers and fiber optic cables, 40G DAC cables available in QSFP+ DAC cables and AOC cables enable short-reach options. For 40G cabling, QSFP+ to QSFP+ (40G to 40G) and QSFP+ to 4SFP+ (40G to 10G) breakout cables satisfy customers for various fiber types and reach requirements. With the price of 100G optics cutting down in 2017, 100GbE network is no longer out of customers’ reach. 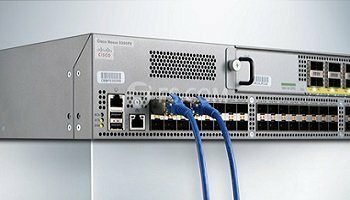 Telecom giants like Cisco, Arista, HPE launches series of 100G optical switches to meet the market demand. And for other 100G components like 100G optical transceivers, fiber patch cables, racks & enclosures, etc, those are ubiquitous on the market. 100G optical transceivers including the CFP, CFP2, CFP4, CXP and the most popular 100G QSFP28 optics in IEEE standards provide a great selection to the overall users. For 100G inter-rack connections, QSFP28 to QSF28 Direct Attach Copper (DAC) Cables and Active Optical Cables (AOC) as well as the QSFP28 to SFP28 breakout cables are the cost-effective solutions. 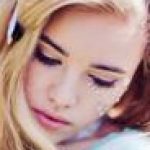 This article introduces 10G/40G/100G fiber optic cabling, and make a clear comparison between the two paths to 100GbE. Customers prefer 4×25Gbps for the reasons: Less parallel paths, fewer fibers, fewer optics, less everything. For those who want to upgrade from 40G to 100G, appreciate the reliable performance of 40G with the potential to run across 2 parallel 25Ghz rather than 4 required today.